The MicroIDE is a cloud based embedded software development environment that allows programmers to access the IDE from any web browser. It matches the features and performance of native IDEs such as KEIL, IAR and Visual Studio. It supports software development in C/C++ and JAVA languages for embedded processors. It combines features like project management, source code editing, flash programming and target debugging in single application. The MicroIDE provides an easy-to-use graphical interface and offer users to choose pre-tested software components to quickly create embedded programs. 2. C/C++, Java Syntax Highlighting. 4. Tabbed view for Source files. 5. Intellisense and auto code completion. 6. Allows users to choose a theme for UI. 7. Highlights Errors/warnings with mouseover description. 8. Keyword searching and refactoring. 12. Source Code Debugging features supporting Watchpoints, Breakpoints. 14. Quick watch variables on mouseover. 15. Source code stepping Step Into, Step Over, Step Out, Run to Cursor. 16. Call Stack with stack frames. 17. Local variable watch for all stack frames. 19. Erase/Program download in single step. 20. Prints log messages through JTAG/SWD using printf() call. 22. Support JTAG adapters J-Link/ ST-Link/DAP and others. 23. Supports built-in GCC/LLVM toolchains. 24. Supports easy configuration of custom tool chain. 1. Uses JAVAC, java compiler to generate Bytecode from JAVA source. 2. IDE converts JAVA byte code to C++ and compiles it with native C/C++ compiler. 3. Device Access APIs for peripherals like UART, SPI, USB and Peripheral Power management and so on. 4. HTTP, HTTPS, Socket, UDP/Multicast, Access point APIs. 5. Bluetooth EDR and LE API. The OT-USB offers USB Host stack, USB Device stack, and USB OTG stack that are built from the ground up for the embedded applications. These stacks are compact, reliable and scalable for small to complex applications. The Onchip USB Host component enables developers to integrate USB host functionality easily into embedded products. It supports USB devices such as USB Flash drives, USB Serial, USB Audio, HID and Vendor specific Devices. It takes responsibility of detecting insertion and removal of USB devices and provides an API for reading device descriptors information and managing the data transfers. Designed with OS abstraction to support any RTOS environment. 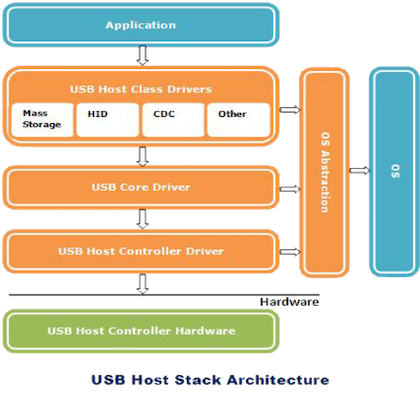 The Onchip USB Host Architecture design (shown above), conforms to USB v1.1 and v2.0 specifications. Its modular design allows easy adaptation to different USB host controllers. Applications can access the USB Host directly by using the USB host API interface, or by the APIs exposed by class drivers. The USB Host Core manages the connected USB devices and provides a framework for the USB Class Drivers. The USB Host Core contains a Hub Driver, which monitors the hub ports for device attach, or detach events. When a new USB device is attached, the Hub Driver enumerates the device and invokes the appropriate USB Class Driver. When the device is detached, it performs the necessary steps to remove the device. Onchip USB Host can handle multiple hubs and devices simultaneously and supports hot plugging of hubs and devices. The USB Host Controller Driver communicates with the controller hardware to transfer data across the USB bus. Onchip USB Host provides drivers for full-speed OHCI and the high-speed EHCI interfaces. Onchip USB Device is a USB2.0 specifications compatible USB device software component specifically designed for embedded systems. It allows developers to integrate USB device functionality easily into their embedded products creating features such as mass storage devices, virtual serial ports, joysticks or audio systems. Allows easy creation of composite devices with selected device interfaces. 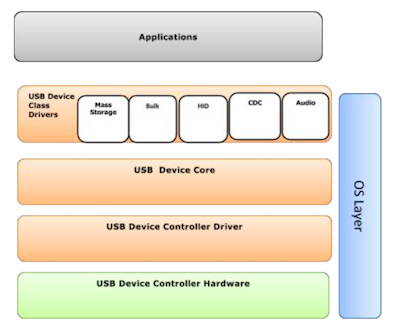 The USB Device Architecture design (shown above), conforms to the USB v1.1 and USB v2.0 specifications, Its modular design allows easy adaptation to different USB device controllers. Applications can access the USB Device directly by using the USB device-programming interface, or by the APIs exposed by class drivers. USB device supports a wide range of Class Drivers, the most commonly requested being Mass Storage, HID, Bulk, CDC and Audio. The USB Device Core layer processes the standard USB requests during enumeration and controls packet reception and transmission. It provides the framework for both USB Device Classes, and Device Controller Drivers including the data transfer functions for control, bulk, interrupt and isochronous endpoints. The Device Controller Driver communicates with the Controller hardware to transfer data across the USB bus. Onchip USB Device provides drivers for various USB MCUs. We provide our customers more than just a software drop. We provide training, support, application customization, porting and other services. We are flexible and committed to provide anything to our customers to develop better embedded USB products that reach the market faster and at lower development cost. Onchip Bluetooth Stack is a Bluetooth SIG certified host software component specifically designed for resource constrained embedded systems. It supports both BLE and BR/EDR in dual mode as well as single mode configurations. The stack is compatible with Bluetooth 4.1 specification. Supports HCI based Bluetooth controllers. Supports BLE GAP and GATT profiles. Supports SPP, HFP, PBAP,A2DP, AVRCP profiles. Provides API framework for developing new profiles quickly. Compatible with any 32-bit CPU with ANSI C compiler. OS abstraction layer supports any OS or standalone without OS. Onchip Bluetooth Stack architecture and design strictly conforms to the Bluetooth V4.1 specifications. The following diagram shows the supported layers within the Bluetooth stack. All layers are configurable by the user. Onchip Bluetooth Stack provides framework to develop new profiles very easily. It currently supports profiles including Serial Port Profile (SPP), Hands-free Profile (HFP) Phonebook Access Profile (PBAP), Advanced Audio Distribution Profile (A2DP) and Audio/Video Remote Control Profile (AVRCP). Onchip will add new profiles based on the request and when the specifications are released by Bluetooth SIG. The Bluetooth core contains the following higher layers of the stack. RFCOMM – is a transport protocol based on L2CAP. It emulates RS-232 serial ports. The RFCOMM protocol supports up to 60 simultaneous connections between two BT devices. RFCOMM provides data stream interface for higher level applications and profiles. SDP – (Service Discovery Protocol) provides a means for applications to discover which services are available and to determine the characteristics of those available services. SDP uses an existing L2CAP connection. Further connection to Bluetooth devices can be established using information obtained via SDP. L2CAP – (Logical Link Control and Adaptation Protocol) provides connection-oriented and connectionless data services to upper layer protocols with data packet size up to 64 KB in length. L2CAP performs the segmentation and reassemble of I/O packets from the baseband controller. HCI Generic Driver – This driver implements the HCI Interface standardized by Bluetooth SIG. It establishes the communication between the Stack and the HCI Firmware in the Bluetooth hardware. It communicates with the Bluetooth controller hardware via the HCI transport layer driver. 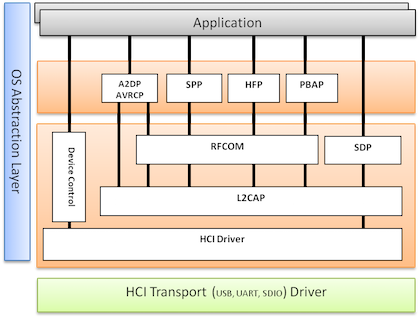 HCI Transport Driver – The Bluetooth controllers are connected to the host using interface like UART, USB, SDIO, etc. The HCI Transport Layer Driver provides hardware abstraction to the rest of the Bluetooth stack software. This driver makes it possible to use Bluetooth stack with different hardware interfaces. Currently UART and USB interfaces are supported. The SDIO support will be available in future releases. The Onchip File System is compact and highly reliable embedded FAT16/FAT32 file system that has been specifically designed for embedded applications requiring data storage to media such as SD/MMC, USB and Flash drives. Easily integrated with virtually any FLASH or physical media device. The Onchip File System architecture (shown above) is designed in a modular fashion that allows it to support multiple different storage I/O devices, and has been optimized for resource constrained devices. 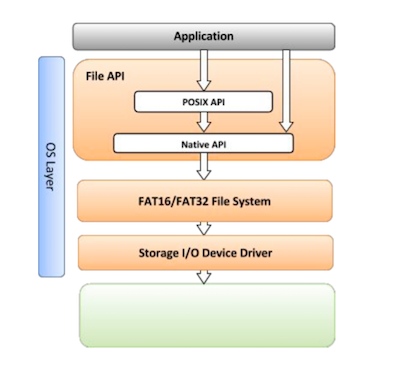 The File System layer implements the FAT16/FAT32 protocol. This layer translates the file operations to block I/O requests and forwards it to the corresponding Storage I/O Device driver. This layer also manages dynamic attachment/removal of storage devices. The File System API layer provides two interfaces to the applications. One is a POSIX interface that provides standard file API functions such as fopen(), fread(), fwrite() and fclose() etc., The second is a Native interface that provides non-standard API for operations like directory management and file system management. The Storage Media Driver is a hardware dependent driver for the file system software stack. It provides low level I/O functions allowing the rest of file system to access the storage devices for accessing NAND/NOR/SD/MMC and RAM Disk devices. Additionally the File System can be used with our USB Host and Mass Storage Class to support most kinds of USB devices. 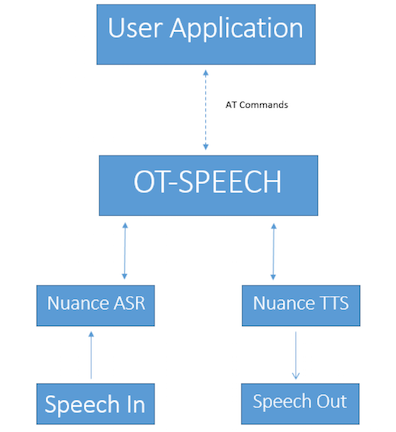 Onchip Speech Stack is a software component that allows developers to easily integrate Speech Recognition and Text to Speech into embedded applications. It is also available in the form of hardware module for easy integration into electronic devices. Fully integrated ready to use module. Speaker independent, no prior learning. Supports UART, I2C or SPI for Text input. Microphone input for speech input. Speaker/headphone output for feedback and speech output. Text-to-Speech Speaker selection – 42 languages with choice of Male/Female voices available. Natural and Smooth conversion of text to speech. Ability to speak multiple languages at same time. ÒNGO hands-free infotainment used in-car for safe & secure driving. Seamless Bluetooth connectivity with freedom from wired connections. It will provide hands-free access to features like calling and music on Bluetooth enabled smart phones. Stop worrying to reach for your phone when it rings. It is at your reach now on, to make and receive calls without having the need to touch your phone. Don’t get restricted with music what you have, listen to any track you like by just saying the name of the album and track. Instant control: Small & stylish wireless remote on the steering, controls the phone and music functions at your fingertip. A wireless remote control mounted on the steering or on the dashboard also for instant access. User can view Phonebook contacts, music playback and calling information on the OLED Screen which is mounted on dashboard. Hands on the steering eyes on the road: The robust voice recognition system of ÒNGO allows you to make and receive calls completely hands-free. It boosts up telephony functions and very comfortable for call handling such as call Accept, Call Reject, End call, Redial and volume control. Just say the name, it automatically dials. 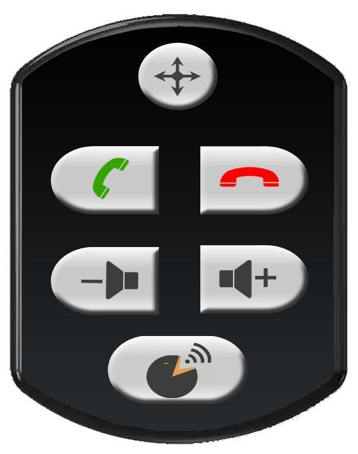 Caller ID announcement & if call comes, users’ voice comes from the existing car speakers. Stupendous Music playback: You will able to access Music on your phone and web in existing car audio speakers of your car easily without ever taking your eyes off the road. Onchip caters high quality sound performance in car speakers. Full DSP Noise reduction/Echo cancellation. Thus it provides Duplex quality. ❖ Sleek and elegant in design. ❖ Seamless Bluetooth connectivity with freedom of wired connections. 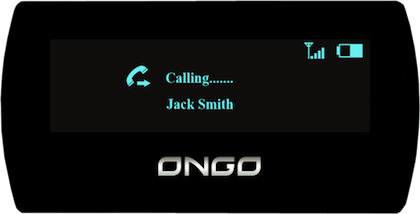 ❖ OLED Display to see phonebook contacts, music playback and calling information. ❖ A perfect solution to connect your family and friends with convenience of voice calling. ❖ Indian Accent Voice Recognition system. Full DSP with Echo cancellation and noise reduction function. External Microphone for clear clarity. Play music from any Bluetooth Stereo (A2DP) compatibles devices. Digital class D 2X 15 watts Amplifier. Number of contacts 2000 per paired phone. Displays the name & number of phonebook in the caller ID. User manual and Quick start guide.